As is typical for Mark, our short Gospel reading packs in a lot of information. After John the Baptist’s arrest, Jesus begins his public ministry with a message of (in Greek) metanoia (repent, turn around, change your mind). Jonah had resisted God’s first attempt to send him to Nineveh, in part because he knew God would show mercy to those who were Israel’s enemies, and he did not want to do it. Nineveh was a great city of the Assyrian Empire. Jonah relents the second time (after being saved from the belly of a great fish) and the city repents, and God forgives, just as Jonah had feared. The story continues with Jonah’s bitter complaint against God. But God’s mercy prevails, even over Jonah. 3:1 The word of the Lord came to Jonah a second time, saying, 2 “Get up, go to Nineveh, that great city, and proclaim to it the message that I tell you.” 3 So Jonah set out and went to Nineveh, according to the word of the Lord. Now Nineveh was an exceedingly large city, a three days’ walk across. 4 Jonah began to go into the city, going a day’s walk. And he cried out, “Forty days more, and Nineveh shall be overthrown!” 5 And the people of Nineveh believed God; they proclaimed a fast, and everyone, great and small, put on sackcloth. 10 When God saw what they did, how they turned from their evil ways, God changed his mind about the calamity that he had said he would bring upon them; and he did not do it. Psalm 62 is a personal testimony of trust in God. As a response to the first reading, the last line is interesting since God decides not to repay the Ninevites “according to their deeds.” Perhaps the ways of God are not as simple as either Jonah or the psalmist imagines! truly, my hope in in him. Paul, like most early Christians, believed that Jesus’ return in glory was imminent. In this context, the following reading makes perfect sense. Paul exhorts the followers of Jesus to rid themselves of all distractions from focusing on the glory that is to come. Jesus, however, would not come again soon, so what does this reading have to offer us? There is a sense in which God calls us to a certain detachment from even those things and people we most cherish, lest we lose sight of the One who is always coming into our lives. 7:29 I mean, brothers and sisters, the appointed time has grown short; from now on, let even those who have wives be as though they had none, 30 and those who mourn as though they were not mourning, and those who rejoice as though they were not rejoicing, and those who buy as though they had no possessions, 31 and those who deal with the world as though they had no dealings with it. For the present form of this world is passing away. As is typical for Mark, our short Gospel reading packs in a lot of information. After John the Baptist’s arrest, Jesus begins his public ministry with a message of (in Greek) metanoia (repent, turn around, change your mind). The kingdom of heaven is at hand. 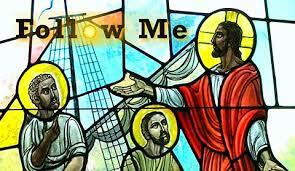 He then calls his first disciples who all leave to follow him “immediately” (a favorite word of Mark). 1:14 Now after John was arrested, Jesus came to Galilee, proclaiming the good news of God, 15 and saying, “The time is fulfilled, and the kingdom of God has come near; repent, and believe in the good news.” 16 As Jesus passed along the Sea of Galilee, he saw Simon and his brother Andrew casting a net into the sea—for they were fishermen. 17 And Jesus said to them, “Follow me and I will make you fish for people.” 18 And immediately they left their nets and followed him. 19 As he went a little farther, he saw James son of Zebedee and his brother John, who were in their boat mending the nets. 20 Immediately he called them; and they left their father Zebedee in the boat with the hired men, and followed him. The Scripture quotations (except for the psalm) are from the New Revised Standard Version Bible, copyright © 1989 by the Division of Christian Education of the National Council of Churches of Christ in the U.S.A., and are used by permission. All rights reserved. The Psalm translation is from The Book of Common Prayer. Commentaries are by Epiphany ESources, 67 E. Main St., Hornell, NY 14843, www.epiphanyesources.com , copyright © 2018. All rights reserved. Permission is given to copy for group use, with attribution.